Solar panels convert the sun's light energy into electricity. Solar cells, or photovoltaic cells, are grouped together and packaged into a panel to produce a specific wattage of electricity. 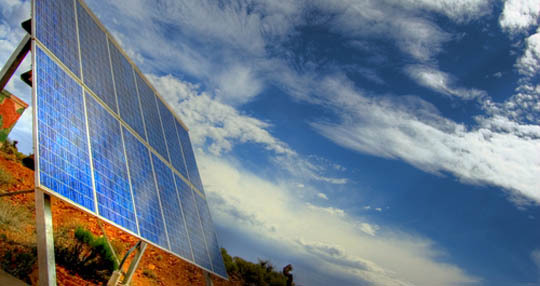 Multiple solar panels are arranged in an array and installed on a roof or in a field that can power a home or business. New Federal tax credits of 30% for solar panel installation have combined with state and local incentives to drastically lower the payback period for a solar power system. With prices of alternative sources of energy rivaling those of fossil fuels, the future of energy is bright. Solar panels come in two main forms. The form most people think of is the photovoltaic solar panel which converts the light energy of the sun directly into electricity. The second type is the thermal solar panel. This panel collects the sun's heat energy and stores it for use in heating or power generation. Good news - new federal tax incentives for both photovoltaic and thermal solar panel purchases allow a full 30% rebate from the federal government. Mono crystalline solar panels are created from solar cells that are cut from a single crystal ingot of silicon. These solar panels are more expensive because of the cost of the special silicon, but are very durable and yield the highest efficiency available (almost 20%). Silicon prices have fluctuated wildly in the past few years, dropping by more than 85% in the last few years. As a result solar panels have dropped in price making home solar panel installation even more attractive. Solar panels made from poly crystalline cells have improved efficiency over the last few years. They now are competitive with mono crystalline in efficiency and at generally lower cost. As a result, most solar panels made today are poly crystalline. Efficiency of these solar panels is typically only 10% less than mono crystalline panels. Solar panel kits are a great way to get started with solar power. Solar panel prices have come down and efficiency has risen in the last few years. New modular solar panel design makes it much easier to assemble the pannels along with the other kit components into a working system. DIY solar has grown exponentially because of these technical advances. If you live in a populated area with access to the local power grid, you will most likely have your soler panels connected to the grid through a special power meter. The concept of "net metering" allows you to sell your excess power back to the local power company, receiving a credit toward your power bill. In some instances your bill can be totally eliminated or you will receive a check from the power company. Imagine that. Most solar panel owners also practice efficient energy use and employ energy efficient appliances and conservation in order to maximize their payback. While net metering is great for those with access to the grid, a lot of solar panel owners have their systems in order to get OFF the grid. We share this goal and purpose. The main difference in going off the grid is in the requirement for a battery backup system and a stricter adherence to efficiency. A fairly large cottage industry in DIY solar panel creation has grown in the past few years. Many DIY'ers are recycling old and broken solar pannels into interesting new devices. Check out the DIY solar page for videos. There are a number of common misspellings for the term "solar panels". It is occasionally spelled solar pannels, sometimes soler panels. You could even spell it soler pannels, or solar panals, but that would be pretty far off... Anyway you spell it, it still means clean, free energy from the sun.